Oakwood Farmers Market - High quality local produce sold direct to the public. The market is held on the third Saturday of each month from 9.00am to 12.30pm at Oakwood Clock. Third Saturday every month. 9am - 12.30pm usually at Oakwood Clock, Roundhay Leeds. Take a 360 degree panorama view of the market. Thinking of going along to the Oakwood Farmers Market and wonder what the weather is like in Oakwood right now? - check out our live weather webcam. If you have not yet taken the time to visit this regular market at Oakwood then you have missed a treat. It's a great spot to buy some fantastic produce, and also a regular meeting spot for locals to catch up with each other. 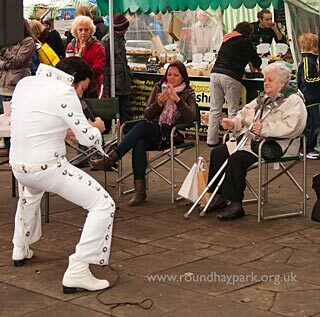 In addition to the stalls there is often entertainment - we even had an 'Elvis' singing under the clock a few months ago! We always try to make it to the market ourselves, and have had 'the best ever..' Salmon Quiche Pie (Hebdens Whitby Fish), and last month we tried the Yorkshire Angus beef burgers from the Yorkshire Highlanders stall, the tastiest burgers I can ever remember. Just some of the fayre on offer includes: Organic Meat, Bread, Eggs, Pies, Ham, Bacon, Cakes, Fish, Fruit and Vegetables, Hot Coffee and Tea, Jam and Chutneys, Potatoes, Cheeses, Venison, Patisseries, Plants, Mushrooms and soups. The Oakwood Farmers Market is the trading arm of the Roundhay Environmental Action Project (REAP).